Chitra Poornima in April-May, Vaikasi Swati Brahmmotsavam and car festival in May-June, Aani Tirumanjanam in June-July, Brahmmotsavam to Mother-Goddess in Aadi Pooram in July-August, Aipasi Skanda Sashti and Annabishekam in October-November and Karthikai Laksha Deepam (lighting one lakh lamps) in November-December, are the festivals celebrated in the temple. The temple is open from 6.00 a.m. to 12.00 a.m. and 4.00 p.m. to 9.00 p.m.
Sri Kokilambikai-Sri Kameeswarar Temple, Villianur, Puducherry. 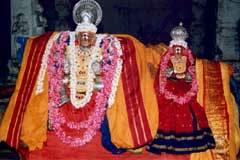 Brahmmotsavam is celebrated for Mother-Goddess on Aadi Pooram day in July-August. 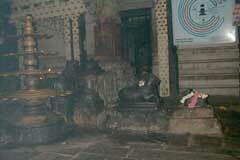 Those suffering from Leprosy pray to the Lord in the temple. Devotees perform abishek with new Vastras (clothing) to Lord and Mother. While offering the Deepa Aaradhana to the deity, a mantra is chanted – beginning as "Om Rajadhi Rajaya Prasahya Sakine" (Sanskrit) in which the word ‘Kameswwara" occurs in the middle of the chanting. 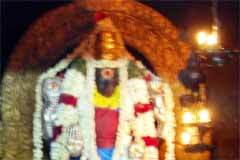 Those desirous of the darshan of this deity Kameeswara should go to Kokilambika-Kameeswarar temple in Villianur near Puducherry. This Nama (name) is pronounced in all the temples. The significance of the temple relates to the history of a Chola King Dharmabala Chozhan ruling Kamalapuri then who suffered from leprosy due to his Karma in his previous birth. 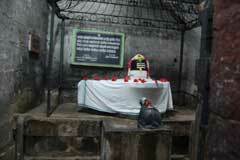 He worshipped Lord Shiva in this temple and got cured. 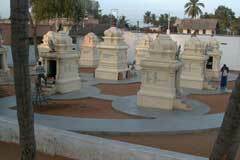 He created a town here which was earlier a forest of Vilwa trees and also constructed a temple and named the place Vilwanallur which in course of time changed as Villianur. 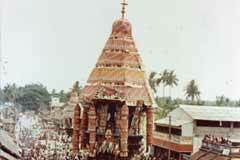 The temple has a mention in Thevaram hymns. 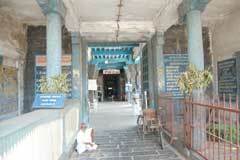 Prasava Nandhi: The other significance of the temple is the Prasava Nandhi. Prasava means delivering a child. Though Nandhi (the bull vehicle of Lord Shiva) usually installed facing the deity, there is also a small Nandhi before this Big Nandhi. Kala Bhairava in the temple graces here without His Dog vehicle and therefore, the place is venerated as a place of salvation. Rays of Sun fall on the presiding deity on 9, 11 and 19 in the month of Panguni (March-April) offering his worship to the Lord. 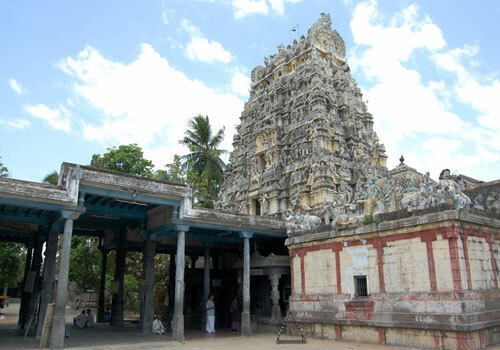 Lord Brahmma, Lord Narasimmah, Indira, Sun, Adisesha (the divine snake), Cupid (manmatha), Moon, King Dharmabalan, Sakalanga Soundari, Govindan and others had worshipped in this temple. 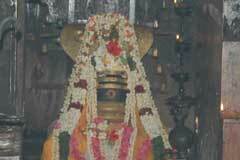 Lord Shiva graced his darshan to Lord Vishnu here on a Poornima day falling on a Sunday. Following this event, devotees throng the temple on Poornima days (Full Moon day) falling on Sundays hoping that the darshan would bring them the boon they seek. Scientific Based The rays of Sun fall on the Lord on 9, 11 and 19 in the month of Panguni – March-April. 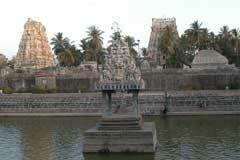 The temple is 10 km on the Puducherry-Villupuram road. Bus facilities are available from both ends.